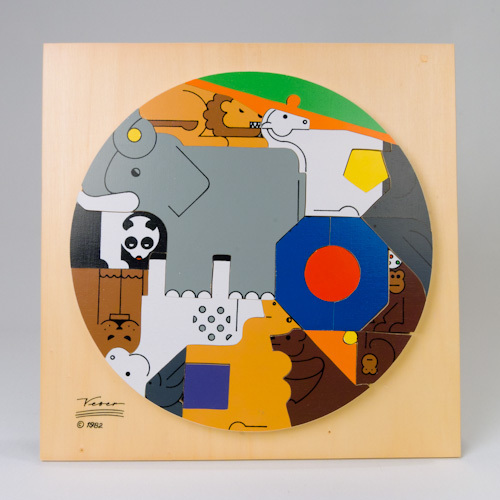 The wood pieces from which the circus pieces were cut double as the packaging of the puzzle. The puzzle was purchased in the midwest in the printed cardboard box in which it was originally packaged and sold. Made in Spain, it was designed by Craig Veser for Faroy, Inc., Houston, Texas. The box and the wood signature indicate it was made in 1982. A separately printed piece that was discovered inside also indicates a connection to VIA, with a Dallas, Texas address and defunct phone number. 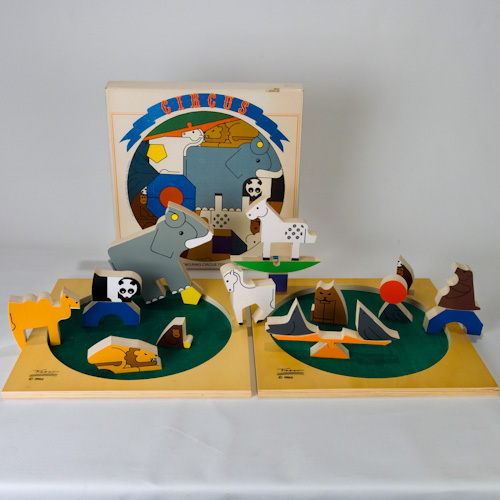 This circus puzzle and its animal characters are endearing, perfectly clean, never used. The edges of the wood from which it was cut, then painted the same character on both sides. The pieces show no rounding. The furniture grade plywood from which either side of the circus rings are made is 9/16″ and the characters are 15/16″. This is different from flat wood or cardboard puzzles because it allows those involved, adult or older child, to work in three dimensions. Of course, given the size of the puzzle pieces, we would not advocate or suggest that the puzzle be played with by young children. 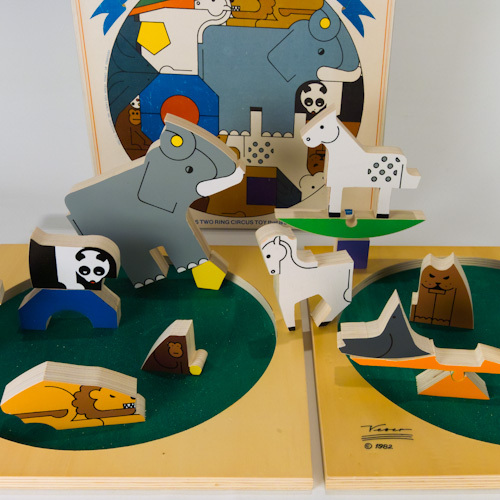 In addition to the puzzle teeter totter and other circus props, the puzzle includes an elephant, tiger, lion, camel, bear, two horses, a panda bear, monkeys, and seals totaling 21 pieces.